Some books seem to fly through your hands; they being that much fun to read. Such is the case with Van Plexico’s new offering, “Vegas Heist.” A serious change of course for a writer best known for sci-fi and superhero prose, this time Plexico ventures into crime fiction and he does so with surprising results. It is quite clear from page one that our author is a Lawrence Block and Donald Westlake fan, as his characters are familiar iconic types seen over and over again in the works of those two great writers. And still, despite these obvious clones, Plexico adds his own satirical whimsy to the caper giving it an authentic historical background and infusing it with a pacing remindful of a short, lit fuse. Any second you know it’s going to explode. John Harper, a professional thief, does his best avoid schemes involving robbing the casinos of Los Vegas. Why? Because the obvious risks far outweighted the slim possibilities of monetary gain. Then one day his old pal, Los Vegas Attorney Saul “Salsa” Salzman calls him with a plan that in its concept is almost foolproof. During during the building of Caesar’s Palace, one of the many construction contractors, one Roy Funderburk, had a secret tunnel built under hotel leading several miles under the city streets to an innocuous exit no one has yet to uncover. With the hotel nearly completed and due to open on New Year’s Eve, all they would have to do is assemble a team, find the hidden tunnel entrance and undetected, break into the vault, steal the cash and be gone before anyone was the wiser. The only glitch is a two bit mobster murdered Funderburk before he could reveal exactly where this tunnel entry was located. But Salsa doesn’t see that as a problem and convinces Harper they can find the disguised locale long before the grand opening. Tempted by the possibility of a rich grab, Harper agrees to take on the job and, with Salsa’s advice, they hire two more men; Tommy Donovan, an old time safe cracker, and Brett Rooker, a big, beefy thug to be their security muscle. With the team assembled, they head to Sin City and the grand future that awaits them. Of course in all such tales, things are never exactly what they appear to me and soon Harper learns that there are other players in their little play. Primary among these are Julian Monti, the small time hood who killed Funderburk, and told Salsa about the secret tunnel, and Lois Funderburk, the dead man’s widow who knows a lot more than they were led to believe. Harper’s personal philosophy is never trust anyone and on this heist, it is one that may just keep him alive. 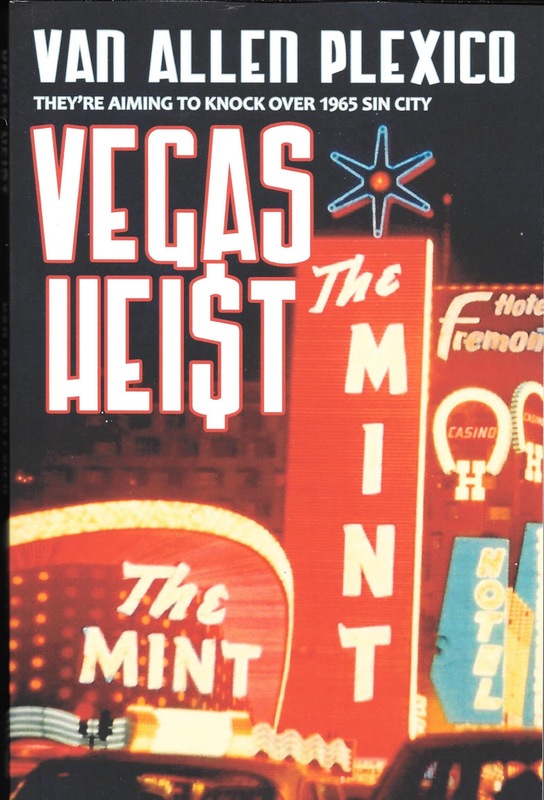 “Vegas Heist,” is one of those books impossible to put down. Like his characters, Plexico brings us along his own devious plotting filled with twist and turns that you don’t see coming until the very end. It is a terrific read and one we highly recommend. As for John Harper, we want more; a whole lot more. In the not too distant future, Pakistan and India suffer a nuclear confrontation which has disastrous results throughout the globe. Ice melting in subartic regions and Greenland causes rising water levels and twenty percent of New York City is lost. Other parts of the eastern seacoast suffer varying degrees of this “nuclear winter” wherein the sun if blocked for lengthy periods of time. Hardest hit is New York and for ten years its survivors learn to live in darkness until the after effects of the catastrophe begin to dissipate and the clouds begin to thin. Scientist start predicting what they call Dayfall will soon herald the return of the sun and banish the stygian darkness. At the same time they caution the authorities that such a dramatic reappearance of daylight could cause psychological issues with the populace and the Manhattan Police Department is put on alert. But how does one prepare for something totally unprecedented? Just as the momentous day is fast approaching, a vicious serial killer emerges on the scene. This fiend butchers his victims with knives, leaving their bloody corpses in pieces. He is soon labeled the Dayfall Killer. Frantic to catch this monster and avoid city-wide panic, the Mayor hires a young Philadelphia detective named Jon Phillips. Supposedly he is uniquely qualified as he had single handedly captured another such killer in Philly only a few weeks earlier. Phillips has only twenty-four short hours to find his new target. And if that challenge isn’t enough as is, he quickly learns there is an underlying political battle at play between the Mayor and an independent police force known as Gotham Security. Owned and conceived by Gar Render, GS wants to usurp the local police with Render as the next Mayor. 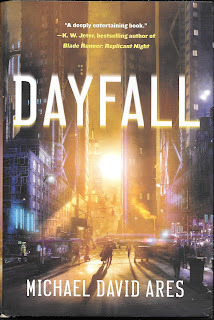 “Dayfall,” is a pulpish noir mix of violence, social engineering and selfish paranoia expertly brewed to create a fast paced, suspenseful thriller unlike anything else on the market today. Whereas it really isn’t science fiction but rather a science thriller. Writer Michael David Ares is definately a name to remember. Receiving books from authors we are unfamiliar with is always an exciting event. It leads us to a new door wherein we wonder what awaits on the other side; something fantastically good, something mediocre or, heaven forbid, something gawd awful. We are delighted to report that P.J. Thorndyke’s “Curse of the Blood Fiends” lands solidly in that first grouping and with a tremendous splash. Enough so that we really hope you’ll take this review to heart and run and get your own copy. Really, it is that much fun. The time is World War II and the military is looking for any advantage it can muster to help us win our campaigns in both Europe and the South Pacific. To that end they sponsor a mad scientist’s expedition to the Rain Forest of the Amazon. It is led by a well known big-game warden named Henry Gross. The scientist is looking for a leaf based chemical that can revive the dead with the intent on using it to bring back fallen GIs and sending them back into combat as unyielding zombies. No sooner is the compound discovered, then Gross is bitten by jungle werewolf and is then himself infected with the curse. He flees the base and returns to his home in Los Angeles in hopes of finding a cure him of his beastly condition. Instead, after a series of depressing encounters, Gross turns into his new hairy persona and begins biting others. Here the entire plot does a wild detour. It seems Gross’ bite not only changes humans into werewolves, but it also transforms others in to vampires. All too soon Tinsel Town is being overrun with these nocturnal monsters. The city police find themselves overwhelmed with creatures far beyond their understanding and abilities to deal with. Amidst all this action, we find Rosa Bridger, a lady P.I. engaged to a Hollowood leading man. 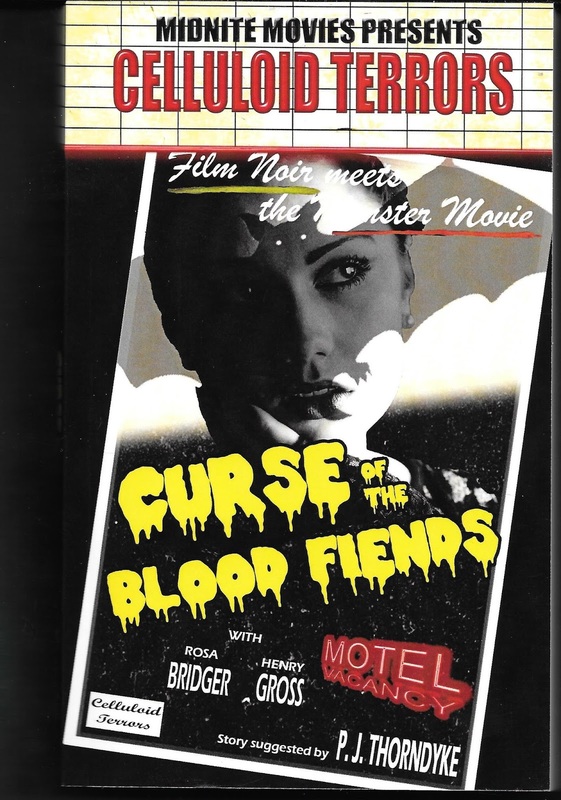 Bridger, in trying to locate a lost starlet, uncovers a vampire nest in Beverly Hills where captive humans are being held as living blood banks to feed to undead. Oh, and did we mention that her fiancee’s younger brother is attempting to revive a thousand year old mummy in the family’s mansion? What P.J. Thorndyke has done is given us all the classic Universal Monsters and brought them together albeit in new and original ways culminating in several over-the-top clashes that had this reviewer cheering wildly. Filled with panache, his prose is controlled and creates a steady pace that never once lets up leading the reader to one of the most satisfying climaxes this side of a Saturday Afternoon Monster Matinee. “Curse of the Blood Fiends” is old-fashion thrills, spills and fun. The kind you thought lost forever. Well, you were wrong. This book has it all. Now go buy a copy!